Singapore Changi Airport is aiming to stimulate traffic growth through a series of incentives and rebates. The initiative comes in response to slower growth and a perceived widening cost gap with other Southeast Asian airports. Changi has set aside SGD100 million (USD80 million) for its new Growth and Assistance Incentive (GAIN) programme, some of which will be used for rebates on parking and aerobridge fees. Some of the funds will also be used to provide incentives for transfer traffic as part of a programme that has not yet been detailed. Singapore’s passenger traffic growth has slowed to only 2% in the first five months of 2014. Even slower growth is possible for the remainder of 2014 driven by a recent drop in inbound visitor numbers from China and a slowdown from Indonesia. Singapore Changi traffic growth began slowing in 2013, driven primarily by a drop in long-haul traffic. For the full year 2013 passenger traffic at Changi was up just 5% to 53.7 million, bringing to an end a streak of three consecutive years of double digit growth. Traffic within Asia remained strong in 2013, with Southeast Asia passenger numbers up 8% and Northeast Asia up 7%. Meanwhile traffic to Europe declined by 5% while Southwest Pacific (Australia and New Zealand) was up 2% and South Asia matched the overall average increase of 5%. The drop to Europe was driven by Qantas, which at the end of Mar-2013 shifted the transit stop of its European flights from Singapore to Dubai. Qantas currently has about 17,000 weekly seats at Changi compared to about 50,000 in Mar-2013. The Australian flag carrier has continued to cut back its operations at Changi this year by suspending Singapore-Perth and down-gauging Brisbane and Sydney. But in 2014 Asia growth at Changi has slowed considerably, driving down the overall growth figures. 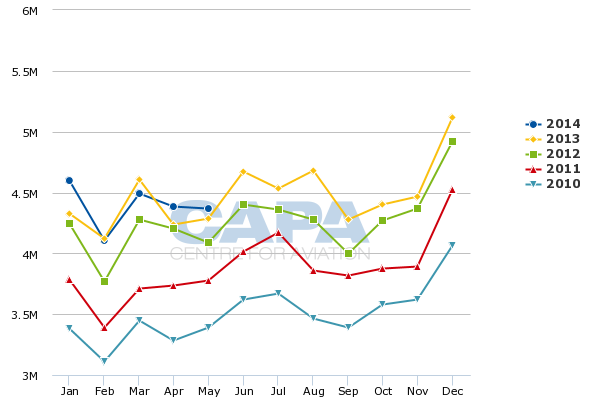 Changi on 23-Jun-2014 reported 2% passenger growth for May-2014 to 4.37 million as well as 2% growth for the first five months of the year to 21.95 million. Year over year declines were reported in Feb-2014 and Mar-2014 – the first monthly passenger traffic decreases for Changi since 2009. Two of Changi’s top 10 markets continued to record double digit year over year passenger growth in May-2014, Hong Kong and Vietnam. But growth in four of Changi’s five largest markets – China, India, Indonesia and Thailand – has slowed considerably. Changi stated that passenger traffic between Singapore and Thailand was down 17% in May-2014, including a 24% drop on the Singapore-Bangkok route and a 7% drop on the Singapore-Phuket route. Traffic between Singapore and Thailand has been consistently down since the beginning of 2014 due to the civil unrest in Bangkok, which has significantly impacted outbound demand from Singapore. Changi is also linked with four secondary destinations in Thailand – Chiang Mai, Hat Yai, Krabi and Samui – but Bangkok and Phuket account for over three-quarters of total seat capacity between the two countries. Bangkok was Changi’s second biggest route in 2013 after Jakarta (includes both Bangkok airports). Currently there are about 110,000 weekly seats between Singapore and Thailand, a reduction of about 11% compared to the same period last year, according to CAPA and OAG data. The slowdown in the China, India and Indonesia markets has emerged more recently and is driven by a drop in inbound visitor numbers to Singapore. Changi has not provided specific figures for these markets but has stated that India and Indonesia markets have been impacted by the depreciation of the Indian rupee and Indonesian rupiah against the Singapore dollar. Meanwhile China passenger numbers have dropped across Southeast Asia since the MH370 incident in early Mar-2014. Indonesia is Changi’s largest market, accounting for about 16% of total seat capacity, according to CAPA and OAG data. China is the fourth largest market, after Malaysia and Australia, while Thailand is the fifth largest and India is the seventh largest. Hong Kong and Vietnam, which continue to see rapid growth, are Changi’s sixth and 10th largest markets respectively. All top 10 markets for Changi are in the Asia-Pacific region, which currently accounts for 89% of Singapore’s total seat capacity. The Singapore-Indonesia market had been seeing steady double digit passenger growth since mid-2013, when airlines started implementing large capacity increases that were made possible by a new bilateral agreement that was signed in Feb-2013. Previously airlines were unable to add capacity to Indonesia’s main metros, limiting growth opportunities to secondary markets. In 2013 the Singapore-Indonesia market recorded 9% growth to 7.4 million passengers, with most of the growth occurring in the second half as it was not until June and July that most of the capacity increases were implemented. But the growth rate has slowed in recent months as Indonesians seem to be travelling to Singapore less frequently due to the weaker rupiah and stronger Singapore dollar, which has increased the cost of holidaying and shopping in Singapore. Several carriers in the Singapore-Indonesia market have started to cut capacity in response to the slower demand. The LCCs in the market have also recognised that the capacity increases pursued last year were overly ambitious. LCC capacity in the Singapore-Indonesia market will be down almost 30% in Aug-2014 compared to Aug-2013 levels. 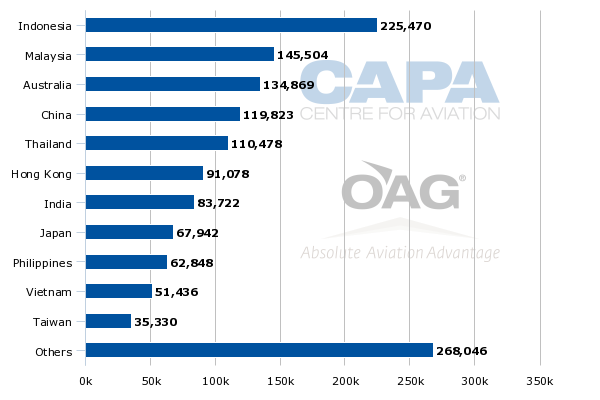 LCCs have accounted for almost all the recent capacity cuts. The full-service carriers competing in the Singapore-Indonesia market rely more heavily on connecting passengers, leaving them less exposed to the slowdown in the local market. India has not seen any significant capacity adjustments as the market remains relatively underserved due to bilateral constraints. But the airlines competing in the Singapore-India market are relying more on connections beyond their hubs as Indian visitor numbers in Singapore drop. The biggest drop in inbound numbers has come from China, which is particularly concerning as it has been Singapore’s fastest growing source market for tourists. The drop has occurred as fewer Chinese tourists are choosing to holiday in Southeast Asia due to the political uncertainty in Thailand and the MH370 incident from early Mar-2014. Singapore has been impacted by these developments as most Chinese tourists holidaying in Singapore combine the small city-state with another Southeast Asian destination, typically Malaysia and/or Thailand. Southeast Asian airlines and airports also have not seen any increase in Chinese origin traffic for destinations beyond Southeast Asia hubs. Airlines have noticed that most Chinese tourists have traded trips to Southeast Asia for domestic holidays. So far airlines in the Singapore-China market have made only small adjustments. Capacity between Singapore and China for the current week is down by about 5% compared to the same period last year, according to CAPA and OAG data. But some airlines have been cancelling and consolidating Singapore-China flights over the past three months, electing not to make schedule adjustments in order to preserve slots at Chinese airports. In 2013 Chinese residents accounted for 15% of total visitors, up from 14% in 2012 and only 10% in 2010. Chinese visitor numbers were up 12% year over year in 2013 to 2.3 million as total visitor numbers in Singapore increased by 7% to 15.6 million, according to Singapore Tourism Board data. 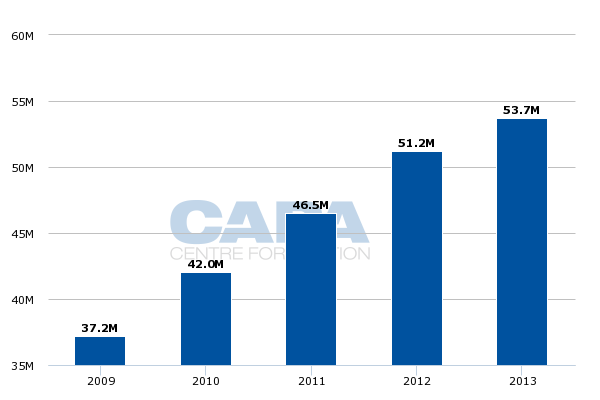 In 1Q2014, growth in total visitor numbers slowed to 2% to 3.9 million. But after solid growth in January and February, there was an alarming 7% drop in visitor numbers in Mar-2014 to 1.27 million. The drop in visitor numbers from Mar-2014, coupled with the drop in Changi passenger figures for the same month, has not surprisingly served as a wake-up call for Singapore’s tourism sector. The Singapore Tourism Board and Changi Airport Group have said they are now investing in destination marketing campaigns to try to stimulate demand in major source markets including China, India and Indonesia. Changi also has responded by announcing on 12-Jun-2014 a programme of initiatives called GAIN that is aimed at boosting traffic figures. Changi Airport Group has committed SGD100 million (USD 80 million) to the programme with some of the funds being used to cover 50% rebates on parking fees and 15% rebates on aerobridge fees. The rebates will be in place for one year starting 1-Jul-2014. The parking rebates will generally benefit long-haul carriers as Changi does not charge for parking unless an aircraft is parked for at least three hours. Although it sounds attractive, the 50% rebate will have a relatively limited impact on total fees as parking is generally less than SGD100 (USD80) per 24 hour period. Aerobridge fees are more relevant as they apply to all carriers. But the 15% discount will result in a mere SGD24.75 (USD19.80) in savings for a typical short-haul LCC flight. The rebates and other initiatives are aimed at improving Changi’s competitiveness compared to other hubs in the region. Airlines serving Changi have complained about the overall costs of operating at Changi including ground handling and security costs. Changi is now working with ground handling providers and security agencies to improve manpower productivity – partially through self-service initiatives – with the idea of reducing costs for the end user. Also using some of the SGD100 million allocated to GAIN, Changi is now working on other incentives including for using self-service options and for growing transit traffic. Details are not yet available as they are still being worked out. Airlines have not yet been briefed on the incentives, an indication that Singapore wanted to show it is responding before deciding how to spend the money. Growing transit traffic is important as the local Singapore market is relatively mature and has been declining in recent months due to the drop in inbound visitor figures. Growing transit traffic is also important for Singapore-based carriers to improve load factors and yields, which have been impacted as demand has not kept up with the surge in capacity. Tigerair Singapore and Singapore Airlines' regional subsidiary SilkAir have been growing particularly rapidly, recording ASK growth of 26% and 12% respectively in their fiscal year ending 31-Mar-2014. As CAPA has previously suggested, Changi needs to boost LCC transit traffic. LCCs now account for 30% of capacity at Changi. Further growth in Singapore’s LCC sector is only viable if Changi emerges as a transit hub for LCC passengers. Tigerair and SIA long-haul low-cost subsidiary Scoot currently achieve a very low volume of transit passengers despite having offered a connection product with support from Changi for the last 18 months. Jetstar sees a higher volume of transit passengers in Singapore but is a smaller overall player. Jetstar accounts for about a 7% share of total seat capacity at Changi, compared to a combined 12% share for Tigerair/Scoot, and has been shrinking its Singapore operation. The rapid growth in LCC transit traffic at Kuala Lumpur, which is now being accelerated following the opening of KLIA2, has been a wake-up call for Changi. Kuala Lumpur International passenger traffic was up 19% in 2013 and 12% in the first five months of 2014, outstripping the 5% and 2% increases at Changi. Senai International Airport in the southern Malaysia state of Johor, which borders Singapore, also recorded 44% passenger growth in 2013 and growth of 36% in 1Q2014 albeit on a much smaller base. Changi is not alone in the region in experiencing a slowing of traffic growth. Kuala Lumpur International recorded growth of only 1% in May-2014, driven by an 11% drop in China traffic. Bangkok Suvarnabhumi has recorded year over year passenger traffic declines every month this year due to the civil unrest in Thailand, including a 14% drop in May-2014. But unlike Kuala Lumpur and Bangkok, the issues facing Changi contain more long term features. Changi risks losing its position as Asia’s fifth largest airport if it does not come up with innovative measures to stimulate faster growth. This is particularly important as Singapore is now investing heavily in airport expansion, including two more terminals and a third runway. There are still sectors – such as LCC transit (where KLIA2 is setting the benchmark) and Africa – with growth potential for Singapore. But getting back on the growth curve will not be easy. The short-term outlook is challenging and Changi will need to dig more deeply strategically than just one year of incentives to improve its long-term position. Incentives may help, but the issues are more fundamental and not all within the power of Changi to control.